Hello, gorgeous! Ivanka Trump nailed her appearance — and owned the stage with her timeless style — at the Republican National Convention&apos;s final night on Thursday, July 21, in Cleveland, Ohio. Watch her eloquent speech in the video above! The VP at the Trump Organization, 34, officially announced her father, Donald Trump, as the Republican Party&apos;s presidential candidate in a sleeveless blush sheath dress from her eponymous collection. While the subtly slitted frock is from her Fall/Holiday collection and so not yet available, a rep for the brand tells Us that it will hit stores this fall and likely retail for $138. Trump completed the ensemble not with a pair of heels from her own line, as she is wont to do, but with Stuart Weitzman&apos;s Nudist ankle-strap sandals (similar styles available for $398, stuartweitzman.com). Another stylish move? Her windblown hair. While she sang her father&apos;s praises, the mom of three&apos;s perfectly straightened blonde tresses blew around her face. Ivanka Trump speaking at the Republican National Convention on July 21, 2016. 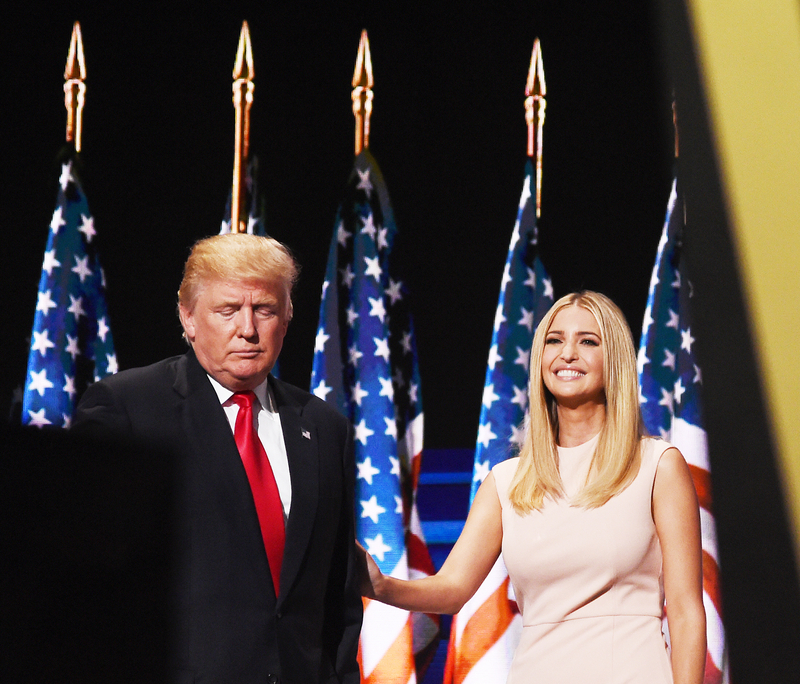 Before making the official announcement, Ivanka, Donald&apos;s second-eldest child, spoke about a number of hot-button issues, including the wage gap between men and women. "At my father&apos;s company, there are more female than male executives," she said to the sound of applause. "Women are paid equally for the work that we do, and when a woman becomes a mother, she is supported, not shut out." Meanwhile, the rest of her family, including her stepmother, Melania Trump, 46, listened from the stands. After her speech snafu earlier this week, the mom of Barron, 10, chose an understated Fendi floral-appliqué wool-and-silk dress, which retails for a cool $2,400 (net-a-porter.com). The frock boasts bell sleeves and crystal-studded buds at the neckline. Later that night, Ivanka took to Instagram to share just how overwhelmed she was by the evening. 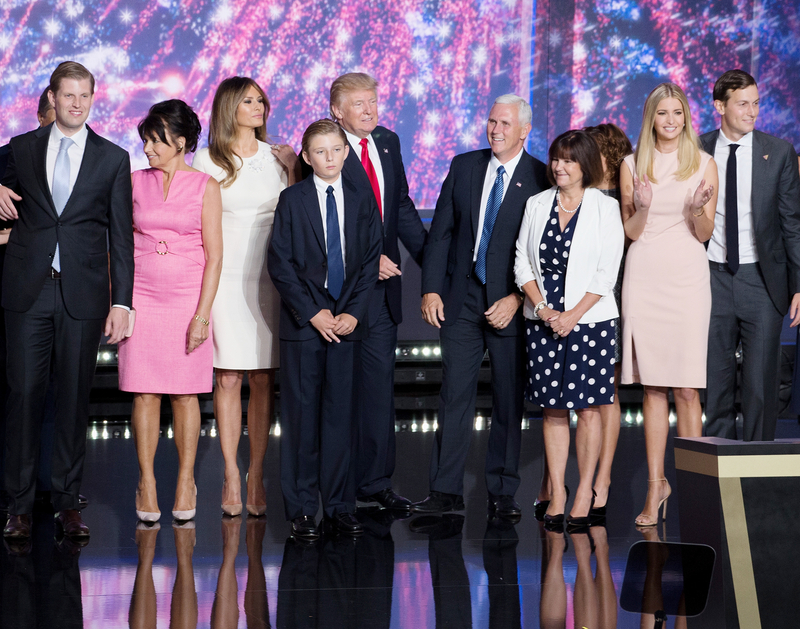 "An incredibly surreal, humbling moment as I introduced my father as the Republican nominee for President of the United States — in front of tens of millions of people!!" she wrote. "I will never forget this night."